Initial evidence recovered from the explosion site showed signs of physical tampering with the gas line or meters. 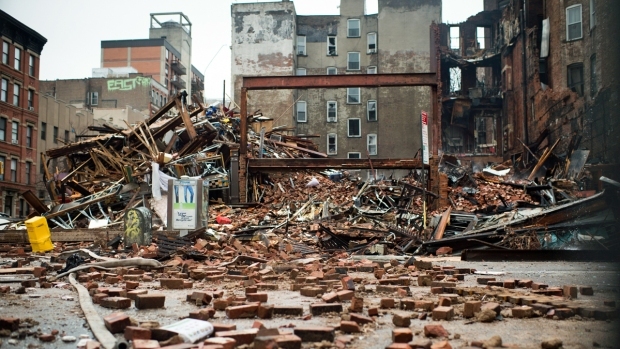 Four of five people facing criminal charges in the gas explosion that rocked Manhattan's East Village in 2015 were indicted for manslaughter in the blast, which killed two people and leveled three buildings. Manhattan District Attorney Cyrus Vance said Thursday that the five suspects "weaponized" 121 Second Ave. when they allegedly bypassed a Consolidated Edison gas meter while renovating the apartments above the building. Landlord Maria Hrynenko, her son, Michael Hrynenko; unlicensed plumber Athanasios "Jerry" Ioannidis; and general contractor Dilber Kukic were all charged with second-degree manslaughter, assault, endangerment and other crimes in connection with the March 26 blast. The explosion destroyed Maria Hrynenko's building at 121 Second Ave., along with two other adjacent buildings between East Seventh Street and St. Marks Place. The blast injured more than two dozen other people and killed Moises Locon and Nicholas Figueroa, whose bodies were both found in the rubble of what had been a ground-level sushi restaurant. A fifth suspect, Andrew Trombettas, was charged with offering a false filing instrument for allegedly filing paperwork on behalf of Ioannidis, effectively renting his master plumber's license to his former partner. All five suspects pleaded not guilty to the charges. Renovations began in 2013, Vance said, and Hyrnenko entered lease agreements with renters in early 2014, before Con Edison had approved the installation of gas meters for apartments in the building. In order to get gas to the units, the landlord told Kukic, the general contractor in charge of the renovations, to tap the line feeding gas to the Sushi Park restaurant on the building's first floor. Kukic allegedly called Ioannidis to do the work. The unlicensed plumber allegedly installed yellow, flexible tubes to feed gas to the apartments in the five-story building. The setup was later discovered by Con Ed, which shut off gas service to the building and told Maria and Michael Hyrnenko to hire a master plumber to install proper gas lines. Instead, the Hyrnenkos and Kukic again enlisted Ioannidis, who installed a series of pipes and valves that tapped gas from an unused line in the adjacent building and was hidden behind a locked utility room door. This setup was the one ultimately blamed for the explosion that rocked the lower Manhattan neighborhood in March. 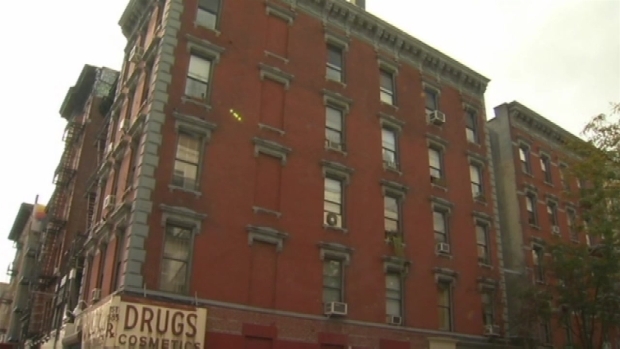 On the same day that a gas explosion killed two people and leveled three buildings in the East Village, a nearby building had its gas shut off as a precaution. But six months later, tenants there still have no working gas. Marc Santia reports. Ioannidis allegedly used Trombettas' plumbers license to file paperwork to have service restored to the building in August of 2014, and the illegal setup was used until the day the explosion. Cyrus said that about an hour before the blast, Con Ed workers did an inspection on the building, and Kukic and Michael Hyrnenko, the building's superintendent, used a valve Ioannidis had installed to shut off the gas supply from the building next door and opened valves to maintain pressure in the system. Vance said that Michael Hyrnenko also told a tenant in the building to tell Con Ed workers that gas had never been supplied to the apartments. After Con Ed tested the system and again rejected the location of a new gas meter for the apartment building, the two men turned the gas supply from the neighboring building back on without first checking to see the opened valves had been closed. Vance said this allowed gas to flow freely into the sushi restaurant, causing an employee there to call Michael Hyrnenko about the smell. He allegedly went back into the basement with Kukic, and the pair then sprinted out of the building without telling anyone in the restaurant or apartments above to leave or call 911. Then, a few minutes later, the blast went off. Locon, a worker at Sushi Park suffered burns to 100 percent of his body and was pronounced dead when he was found. Figueroa, a diner, was also found dead in the rubble. Thirteen other people, including at least two firefighters, suffered serious injuries. An attorney for Maria Hrynenko didn't return a message seeking comment. Attempts to reach the others were unsuccessful. The defendants were to be arraigned Thursday afternoon, and it wasn't immediately clear if they had attorneys who could comment on the charges. 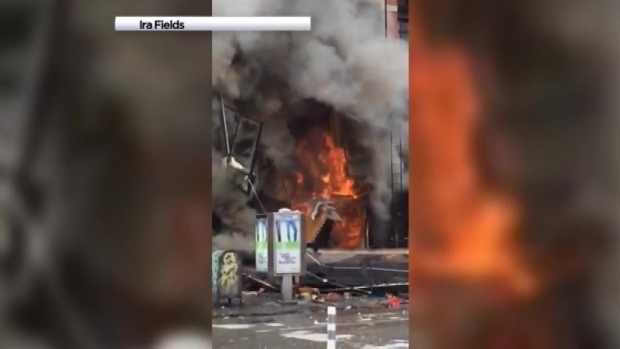 Witnesses share their video of the East Village building explosion and fire. First video by David Hollands, last video from FDNY.